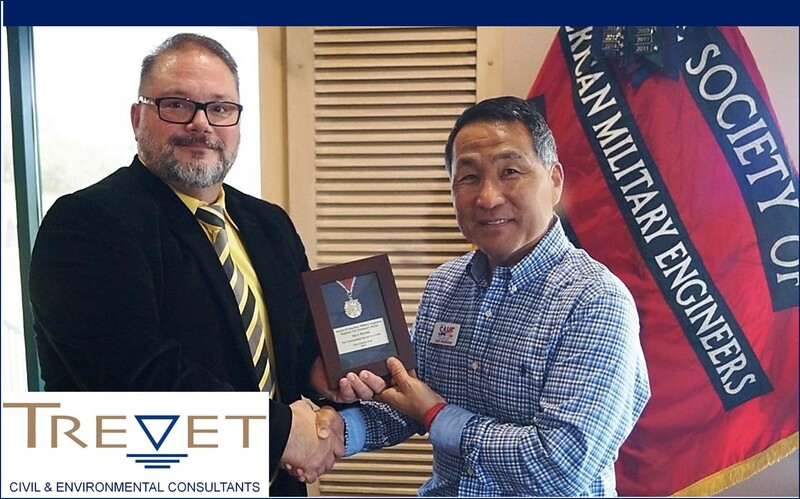 Tae Parrish Receives Texoma Regional Vice President’s Medal for Outstanding Service to the Society of American Military Engineers | Trevet, Inc.
San Antonio, Texas (March 21, 2019) — Society of American Military Enginee rs San Antonio Post President Scott Mikos presented Trevet Vice President Tae Parrish with the Texoma Regional Vice President’s Medal for Outstanding Service during the March monthly meeting at Fort Sam Golf Course Club House. A long-time volunteer on the Small Business Conference Committee, Tae has been instrumental to the success of the SAME Small Business Market Research Fair (SBMRF) for many years. As the 2018 SBMRF Committee Chairman, he coordinated the event, which raised $70,000 for the Post Education & Mentoring Fund. Trevet joins the Society of American Military Engineers in congratulating Tae on this significant accomplishment and many others in supporting the organization and its volunteer and fundraising efforts.